In the tradition of Andrew Weil's bestseller Spontaneous Healing, and aimed at the 78 million baby boomers hitting the "memory barrier", this is a physician's breakthrough medical program for the brain designed to diminish the effect of memory impairment caused by stress, aging, and Alzheimer's disease. As we grow older and experience the stresses of life, at about age 40 many of us begin to have trouble remembering things, concentrating, and generally staying mentally sharp. 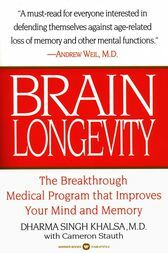 This book contains a four-part program including nutritional, stress-relieving, pharmacological, and mind-body exercise therapies to help people overcome the undesirable effects of normal brain "aging". By controlling cortisol, a hormone that is toxic to the brain and present in excessive levels as we age, Dr. Khalsa's plan can help improve memory and emotional zest. -- detail the physical damage done to the brain by stress, how it adversely affects memory and our other mental abilities, and what can be done about it.